Hello and welcome to PODCAST ON FIRE! Scottish Edition! Yes, myself and the Easy A – Andy Walker return to wax lyrically about Hong Kong Cinema and this week is a paid episode! The fine people at Metrodome have set us up with review copies of Peter Chans; WU XIA aka DRAGON! 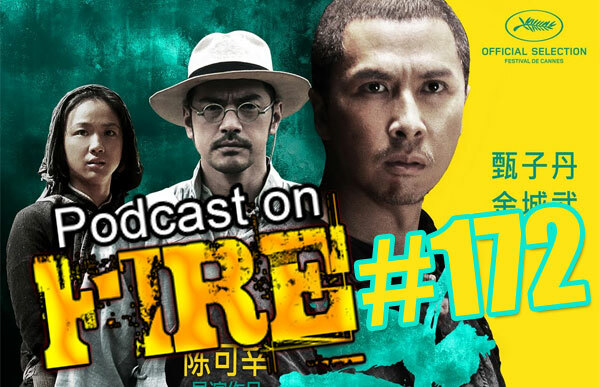 Starring the YEN, Donnie Yen and Onimusha Legend Takeshi Kaneshiro! House Keeping; Contact the show via email at podcastonfire at googlemail.com, on our Facebook page and Facebook group or Twitter (@podcastonfire, @sogoodreviews) and SUBSCRIBE to our iTunes feed. Music courtesy of Brian Kirby (http://briankirby.net) whose awesome clothing line you can find athttp://www.shelflifeclothing.com/. We are also featured on All Things Film, a collection of like minded Film, Cinema, TV, Geek and Cult Podcasts.